What is NLP MindFest ? NLP Mindfest is a great way to dive into NLP and come away with a handful of mental processes that can change your life forever. When does NLP Mindfest Start ? NLP MindFest is going on right now and for the next 10 Days, each ay you can listen to Two sessions for Free if you register now. Do I need to have experience in NLP ? At the moment Marilyn Devonish and Paul Scheele are offering a bonus session as an Introduction to NLP. Why should I be interested in Listening online ? If you register For the next 2 Days This High Value seminar is offered absolutely Free for the live Training. You certainly will gain insight into fabulous Tools that will give you brand new ideas. What are the Subjects being covered ? 14) Living Brilliantly: How to find your personal "sweet spot"
All at no charge for you, and completely commercial-free. **Bonus in addition to all this you get a free session when you sign up now ! When you sign up today, you will receive immediate access to a special introductory session with NLP Mindfest Host Paul R. Scheele and Marilyn Devonish, an NLP expert from England. We will give you an introduction to NLP as well as a couple of techniques you can use instantly. You don’t have to wait until September 12! You’ll get your first program today! 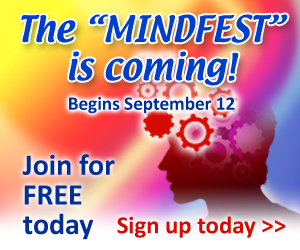 If you want to participate in this great Mind Fest then click on the link below.